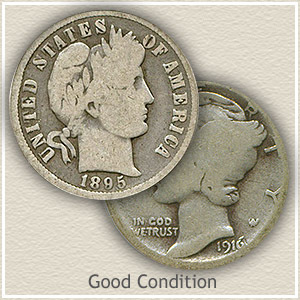 Minimum 1916 dime value is $1.50 for a coin in "good" condition, closely following its silver value. 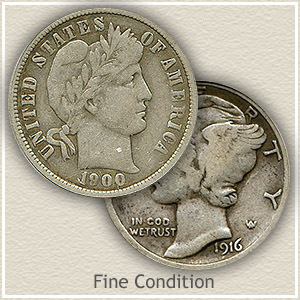 Of added interest to collectors, 1916 is the ending of the old Barber dime series and the introduction of Mercury dimes. Each series has its differences in values. And depending on the mint that struck your dime the possibility of a very big change in value. The Denver mint struck the least amount of dimes in 1916 and minted only the Mercury series, creating a rare dime in great demand by collectors. Today's value of a well worn example is over $524. The main mint in Philadelphia and the third mint in San Francisco also produced dimes, all combined, Barber and Mercury 1916 dime value has five date and mintmark combinations. Three mints produced dimes for this year. Starting with the rare Denver mint coin, it is identified by a "D" mintmark found on the reverse. The San Francisco mint used an "S" mintmark also located on the reverse, and Philadelphia, the main mint, did not place a mintmark on coins. Also moving values up or down is the eye appeal of your coin, is it sharply detailed or very worn? Below are images showing coins representing various stages of wear, helping judge how much your 1916 dime is worth. Rare coin collectors describe the surfaces of this dime as frosty white. Combine mark free surfaces with the original bright luster from the day it was minted and this 1916-D Mercury is a true rare dime. It took a hammer price of $26,450 competing against multiple bidders at a David Lawrence Rare Coin Auction to secure a rare addition to an advanced dime collection. Handled carefully, and protected from the elements allowed this coin to survive to the present in a rarely found pristine condition. Dealers and collectors welcome such a find. 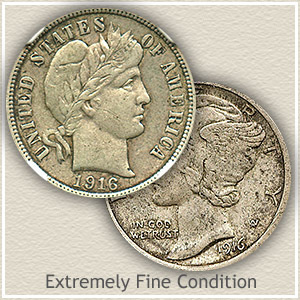 Quality and originality does enhance your 1916 dime value, from the ultra gems to the worn examples in the lower grade. The chart shows the value of a 1916 dime in "extremely fine" condition is far higher than a coin in "good" condition. Collectors and dealers are always searching for the best quality, best preserved coins. They judge the condition of each and assign a "grade." Comparing your coins to the images finds the accurate condition value on the chart. Uncirculated: No wear is visible on the surfaces. Mint luster, the radiating shine, is unbroken. These dimes appear as brand new although toning is often present. Rotate your coin under a light, examine the cheek area for breaks in this luster. 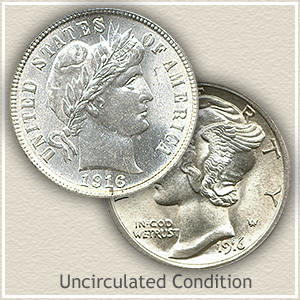 A Barber or Mercury dime in uncirculated condition is always in demand. Extremely Fine: Even wear, but very light, is typical of this condition. All of the design details are very distinct. Upon close examination, flatness of once rounded details is evident. Dimes in extremely fine condition stand out as crisp and sharp in appearance. Good: After many years of use the portraits of each series are reduced to just an outline with little detail remaining. 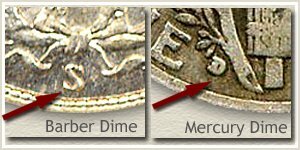 The rim of the Barber dime is distinct, however the rim of the Mercury dime is beginning to merge with the lettering. Worn almost smooth these dimes are at the low end of the 1916 dime value. 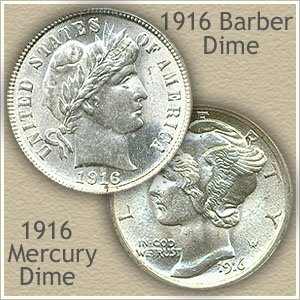 Values listed for the entire Mercury dime series including more on the 1916 dime value. Rare and valuable dates are scattered through out the series. Additionally, the condition of your old dimes play a key role in value. One of the most popular and widely collected coins today. Spanning over two hundred years of US dime production and literally hundreds of date and mintmark combinations. Examine closely these small potential treasures. Coin Values Discovery... finds 1916 dime value and... all old US coin values. It is an excellent index with images and text links to all coin series, from Cents to Gold. Value charts, plus grading images with descriptions uncover how much your box of old coins is worth.